↑ "Alexandre Dumas, père". Encyclopedia Britannica. สืบค้นเมื่อ May 5, 2017. ↑ "Alexander Dumas (1802 – 1870)" (PDF). The British Library. สืบค้นเมื่อ May 5, 2017. ↑ Toussaint Louverture was commissioned as "general-in-chief" of the army in French Saint-Domingue during the Haitian Revolution. Alfred-Amédée Dodds, who was of one-eighth African descent, became a general of division in 1898 and general-in-chief in 1900, but commanded only colonial troops. La Revue hebdomadaire, 2nd series, 4th year, v. 9, 4 August 1900, n.p., and in Mariani, Angelo and Uzanne, Joseph, eds., Figures contemporaines: Tirées de l'album Mariani v. 6 (Paris: H. Floury, 1901), n.p. "Le Général Dodds". Abram Petrovich Gannibal had achieved major general rank in the Imperial Russian Army by 1752. 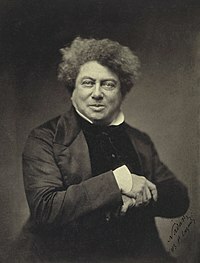 In continental Europe, however, Alexandre Dumas is the only general of division and general-in-chief in modern history. ↑ 5.0 5.1 "Alexandre Dumas". New World Encyclopedia. สืบค้นเมื่อ May 5, 2017. ↑ "Alexandre Dumas - Biography". The Famous People. สืบค้นเมื่อ May 5, 2017. ↑ "Alexandre Dumas - Author, Playwright". Biography.com. สืบค้นเมื่อ May 5, 2017. หน้านี้แก้ไขล่าสุดเมื่อวันที่ 7 พฤษภาคม 2560 เวลา 14:25 น.